A delightfully weird aesthetic is wasted on a fighting game-platformer hybrid with shallow combat and structural twists that failed to grab me. A skull-faced demon who plays the violin, tree monsters, and a winged lion with a mouthful of eyeballs spout from the nightmares of a warlock sleeping deep beneath the Chilean capital of Santiago. Much like ACE Team's Zeno Clash and Rock of Ages, Abyss Odyssey takes its imaginative setting and character design to the edge of madness and creates a world that is a pleasure to be weirded out by. But unlike those games, where the presentation was matched with equally creative gameplay, Abyss Odyssey feels like an ill-conceived mishmash of better fighting and platforming games. You start each game on the surface and try to make your way to the bottom. Enter a new level of the abyss, leap over lava, fight a couple of enemies, and find your way to an exit to the next room. Sometimes you can choose from a couple of exits, one leading to a harder level with better rewards, or another where you might find a checkpoint. Whatever path you'll pick, after about 16 rooms you'll end up fighting the warlock. If you win, you'll interrupt his nightmare and start the whole adventure over again. Unless you have a token for a checkpoint, death will send you all the way back to the surface, but much like Spelunky, Rogue Legacy, and their ilk, failure is not a net negative. You keep your gold and experience, so you can start the next trip down with more health, stronger attacks, and more cash to buy better gear from merchants along the way. 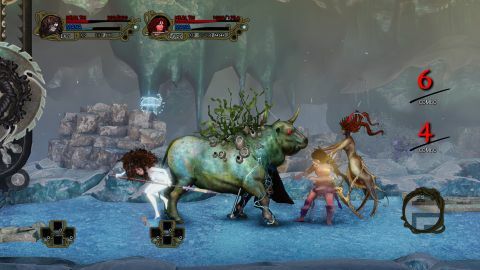 Abyss Odyssey's combat copies Nintendo's oddball fighting game Super Smash Bros. down to the little quirks: the bubble shield position from which you can dodge to either side, and executing special moves by pressing the attack button and one of four directions at the same time. I like Smash Bros., but I wouldn't want to play it without the silliness and excess of overpowered item drops and asymmetrical levels. Abyss Odyssey's combat is like Smash Bros. without the fun props, and it's just not enough. I don't have different strategies for when I'm facing a giant wooden bull and when I'm facing a giant bird man with a spear and shield. There's no need or strategy. I am on one side of the screen, the bull is on the other. I could hit him with a fireball, or try to jump and attack him midair. He could use a charge attack, or hit me from below with his horns. With enough mana, I could even try to capture him as a spare playable character that tags in when my main dies, but all characters play very similarly despite their outlandish appearances. Sometimes I get lucky, corner the bull and take advantage of his long recovery animation to beat him like he owes me money, but I never needed to be skillful or smart. Whatever choice I make is pointless because jamming on the attack button and praying is usually just as effective. If I try something more complicated, I'm frustrated by how Abyss controls. I know what I want to do, but the character can't keep up with my input. I consciously slow down, wait for an attack animation to finish, carefully turn my character to face a ghost king who wields a sword with his mouth, and wait for him to get up so I can continue pummeling him. The slow, rigid character movement should make combat feel deliberate, forcing me to consider every strike, but it just feels sluggish and annoying. Rogue Legacy and Spelunky incentivize you to keep trying by giving you short- and long-term goals to shoot for. Abyss Odyssey doesn't. It took me a handful of attempts (a little less than two hours) to defeat the warlock with the first playable character, the nimble fencer Katrien. Defeating him unlocked another playable character, the slower but stronger Ghost Monk, who I defeated the warlock with on my first attempt. I could keep playing, level up, and unlock another character, but why? Abyss Odyssey doesn't have a good answer. Its levels are randomly generated, so they're never quite the same, but they're never different enough to make it feel like a new experience. ACE Team also says the abyss will evolve over time with “community oriented objectives” where, according to some mysterious math, once enough players beat the warlock, he and the abyss will change and introduce new items. This is an interesting idea on paper, but I only know about it by watching the developers talk about it in a video, and any such progress toward upcoming changes is practically invisible to me as a player. I also spent some time on the game's Steam forums reading opaque explanations from ACE about when the abyss will change and how. It has failed to communicate why this feature is cool, or that it's even included. I didn't learn anything while playing Abyss Odyssey. The level of skill I had when I started the game, which was good enough to get me to the warlock, was the same as when I stopped playing it. Without an apparent, persistent goal between runs to keep me interested, and tissue-thin moment-to-moment gameplay, all the visual and tonal quirk in the world couldn't tempt me to spend any longer with Abyss Odyssey, even if it theoretically changes in the future.